PRAYER PROMPT ••• No one ever said life was a fair. But isn’t that what we want? A life spent enjoying pretty lights, cotton candy, playing games, and laughing on rides? We expect life to hand us a fistful of tickets and tell us to go enjoy ourselves. But it turns out, life’s not a fair, and it’s not fair either. People will get recognition they don’t deserve and the outstanding efforts of others will be ignored. 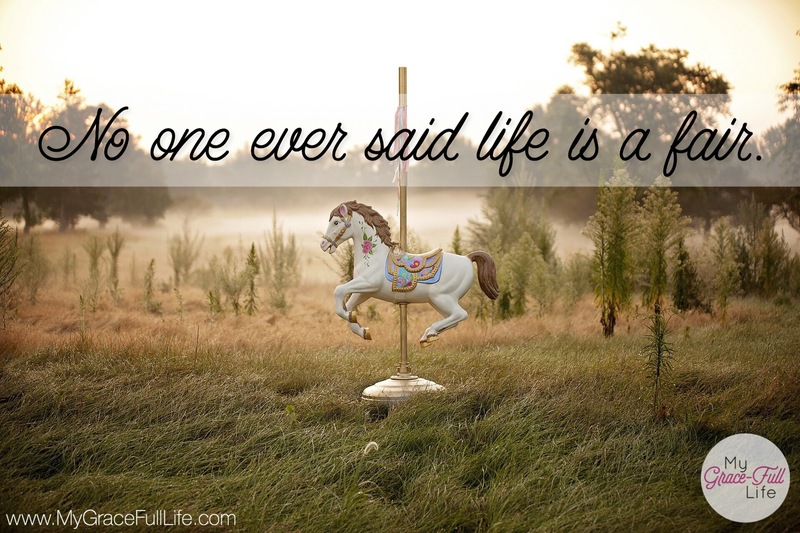 If life was a fair – it would get pretty dull. And if life was fair – what motivation would we have to work hard? No one likes facing trials and disappointments that inevitably come in life, but if we take a moment to stop thinking of how unfair life is, we can maybe begin to look for the lesson or purpose of the pain. This was my Ah-ha moment this morning as I read of Judas’ betrayal of Jesus in Matthew 26. As Jesus was being arrested by the accusers, Peter used his sword to cut off the ear of a slave. I admit, until today, I viewed this scene as a logical course of action by the disciple. Jesus was being wrongly arrested and accused. Peter acted in defense of his Leader and Teacher. But Jesus said, “Put away your sword. Those who use the sword will die by the sword. Don’t you realize that I could ask my Father for thousands of angels to protect us, and he would send them instantly? But if I did, how would the Scriptures be fulfilled that describe what must happen now?” (Matthew 26:52-54). Was it fair for Jesus to be betrayed? Was it fair for Him to be falsely accused? Was it fair for Him to be beaten? But He didn’t come to earth to enjoy cotton candy and rides. He came to be a Savior. And it wasn’t fair but if life was fair, we wouldn’t be lost sinners in need of saving. People want the fun and festivities forgetting that there’s a heaven. If life was perfect here, what would be the point of heaven? Our perfect lives will come when we arrive in heaven. When we face hard times, we have to realize what Jesus knew to be true. Yes, God could prevent the hurt and pain. But sometimes the challenges we face are for our own good or, as was the case for Jesus, for the good of others. Sometimes unfair trials happen so when we come out on the other side as a survivor, we can encourage others who need our exact brand of encouragement. Today, as you pray, thank Jesus for drinking from the unfair, bitter cup because He knew it was the only way we could be saved. If you’re going through a difficult time, ask the Holy Spirit to help you and guide you through it, while you lean on Him.